Useless article. I don’t want to paste special. I hate paste special. What I want is to paste without formatting using a similarly simple command. So how do I record that Macro in Word 365? Thats what you should be explaining. If you have a query, by all means you can post it here. But I prefer to work in a professional manner. The title itself clearly states that this article is for people who WANT and who USE paste special. If you do not like Paste Special for whatever reason, there was no need to read this article in the first place. The fact that this article is useless (the right word is irrelevant) should have been known to you BEFORE you started reading the article. Anyway, I do understand what you want. Here is the answer. Paste As Usual. Press Ctrl and T. That is how you get paste without formatting. 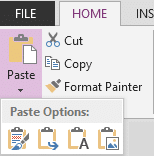 If you want ONE keystroke to do so, customize Quick Access Toolbar and add an option “Paste and Keep Text Only”. Make sure the option is amongst the first 9 buttons in QAT. Then you will get a direct shortcut Alt 1 to 9 depending upon the button position.